The complete text of Palmer's obituary as found on the Sauk Valley Newspapers site. ROCK FALLS — Palmer “PC” Swanson, 71, passed away Friday, March 13, 2009, with his family at his side at Kindred Hospital, Sycamore, after a long illness. Palmer was born Nov. 21, 1937, in Chicago, the son of Palmer and Margaret Swanson. He was a 1956 graduate of Rock Falls High School and attended the University of Illinois. Palmer married Joan Davis on May 28, 1958, in Rock Falls, and raised four wonderful children with her. He married Mary Christine Browne on March 2, 1990, in Rock Falls. 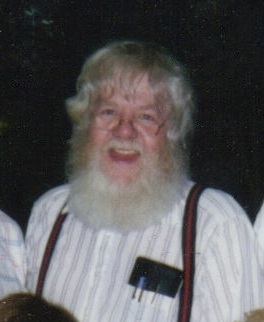 Palmer retired from General Electric Co. after 37 years; retired from teaching at Sauk Valley Community College after 10 years; portrayed Santa Claus for 15 years; and owned and operated Valley Magic for more than 30 years. Palmer was a multi-talented man beginning with magic. His parents gave him a book about magic on his sixth birthday and he never stopped performing his whole life. Palmer loved puns and was the International Punster of the Year in 1995. He published a column about pun humor in the Daily Gazette for several years. Palmer was involved in theater productions at Camelot Dinner Theater and was a co-founder of Mortimer Productions, as well as co-writer and producer of murder mysteries for “Murder on the Menu.” He co-authored a book of Halloween puns, “Puns Spooken Here,” with Richard Lederer. Palmer was active in Jaycees as a local, state, and national officer; a board member of Rock Falls High School District 13; and was a member of Optimists, Mensa, Three Sheeters Club of Chicago, IBM Magic Ring No. 11 of the Quad Cities, and Immanuel Lutheran Church of Rock Falls. Palmer is survived by his wife, Mary Christine; his former wife, Joan of Wisconsin Rapids, Wis.; three children, Eric (Tina) Swanson of Sterling, and Sonja Swanson and Mark (Yolanda) Swanson, both of Wisconsin Rapids, Wis.; three stepchildren, Catherine (Jimmy) Smith of Montgomery, Ala., Nicholas (Sharon) Browne of Davenport, Iowa, and Christopher (Genea) Browne of Plainfield; his brother, Robert Swanson of Lyndon; one sister, Kathleen (Michael) Kleiber of Morton; eight grandchildren, Conan, Kayla, Natalie, Kyle (Katie), Blake, Alec, Ryann, and Taylor Swanson; five stepgrandchildren, Morghan, Payton, and William Browne, and Josh and Jake Bertolozzi; five great-grandchildren, Gage, Bryce, Maddix , Coen, and Peter Swanson; three nieces; two stepnephews; one aunt; and many cousins. PalmerPCSwanson.php last updated January 27, 2019.